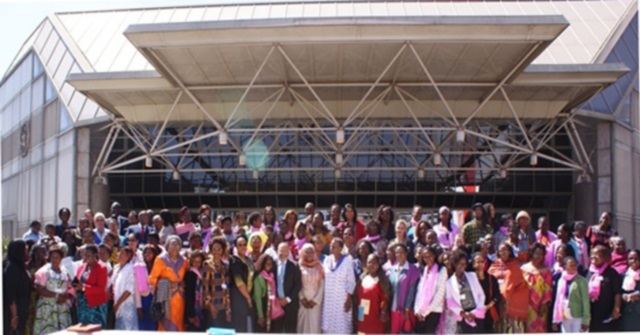 Climate change and justice was among the subjects debated at the 23rd annual ‘Gender is my Agenda Campaign’ (GIMAC) Pre-summit Consultative Meeting on Gender Mainstreaming in the African Union (AU), which was held January 23-24 in Addis Ababa, Ethiopia. The event focused on “Women in Agriculture and Food Security”. Representing the Mary Robinson Foundation – Climate Justice, Programme Manager Mary Faherty provided an intervention to the discussion during the session: ‘Empowering Women in Agriculture and Food Security’. She highlighted Africa’s growth rate and the reality that such growth cannot be sustained if development is undermined by the negative impacts of climate change. Ms Faherty pointed to how women in particular are affected by climate change, as evidenced by the statistics quoted during the session, namely that 90% of agriculture is rain-fed and that 70% of small holder farmers in Africa are women. She added that it was important to include the voices of women, farmers and youth in decision-making processes including the climate change and post-2015 development processes. Fatima Denton, Co-ordinator for the African Climate Policy Centre of the United Nations Economic Commission for Africa, spoke of the need to invest in science and technology, as an increasingly unpredictable climate threatens the food security of millions who rely on agriculture in Africa. She also called for more robust policies that sufficiently bring climate change into the mainstream. Ms Denton also spoke of the need for increased knowledge and innovation to deal with the problems brought about by climate change, while integrating the agricultural sector with others like water and energy. The two-day event went on to address other crucial issues including reproductive health, and emerging conflicts on the continent, including South Sudan, the Democratic Republic of Congo (DRC) and the Central African Republic (CAR).